See family bible of Georg Adam Gaiser and Agatha Heizman. The couple settled in Stephen Township, Huron County, Ontario where they raised their children on a farm near Crediton. Salome Schwartz was a maternal aunt of Kathleen Mae Wurm. Kay was about 9 years old when her mother died of cancer. Salome offered to raise Kay. Kay decided not to leave her father but remained very close to this family. Farm was located on the first road west of Crediton, Ontario at lot 10, conc 9, Stephen Twp, Huron County, Ontario. 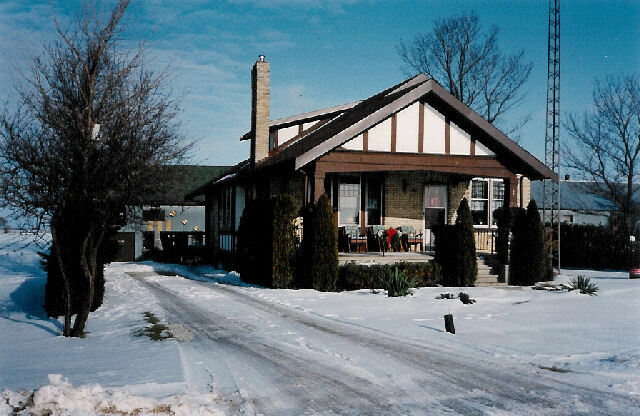 After they left the farm, they moved to this home in Crediton, Ontario. Bill Gaiser (on right) with Clint Hodgins, famous driver, and "Katie Keyes", champion of 1955. Two Schwartz sisters both married men named William Gaiser. To reduce the confusion within the Schwartz family, Salome's husband became known as "Black Bill" and Sarah's husband became known as "Red Bill". [S067061] Family Bible of A. Georg Gaiser.